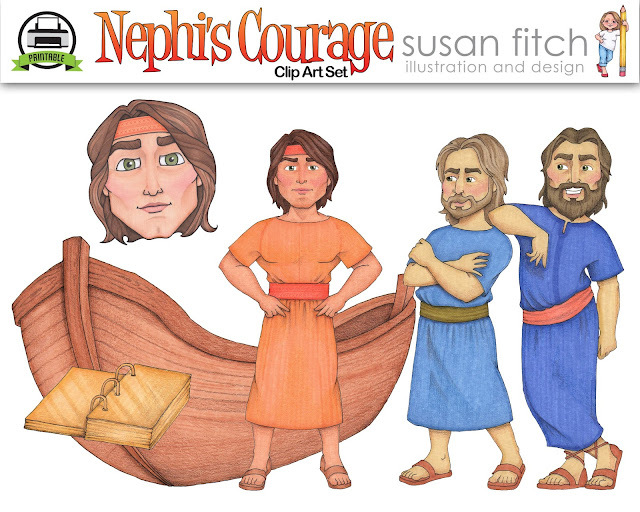 I'm going to teach the 1st and 2nd verses to Nephi's Courage this Sunday and then the 3rd verse next week. I thought the first 2 verses go together nicely since they are all about Nephi. The colored artwork is available on her Etsy shop HERE, or a black and white version is available on her blog HERE. UPDATE: Now complete with Laban! I have her colored images pictured above that I printed on white card stock, laminated, cut out and attached to a popsicle stick. I may swap out the popsicle stick for a paint stick so they are a little bigger. You can also use Nephi and Laman and Lemuel from HERE, Laban and the plates from HERE, and the boat from HERE. 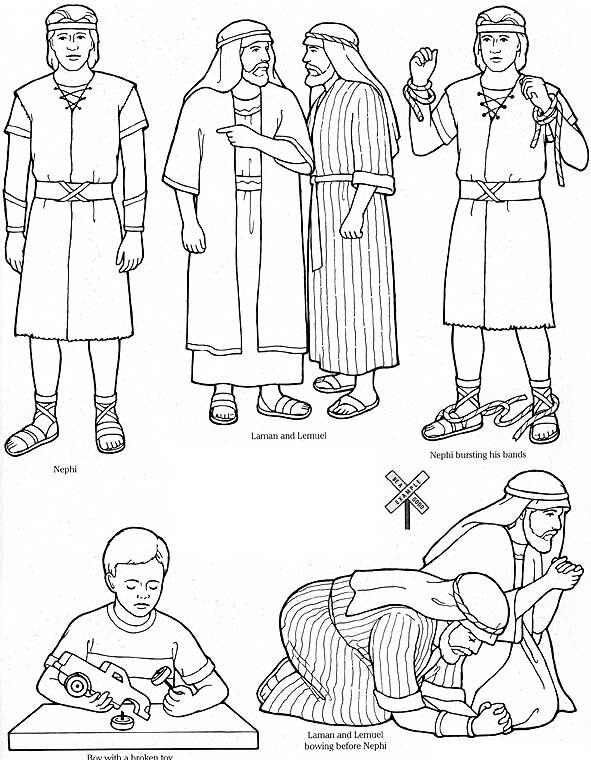 These images all originated from lds.org. If using these images, copy them onto a Word document, enlarge them to be the sizes you like and then print each page on card stock (discard the extra images). Color, and tape to popsicle sticks. After the chorus is learned I'll pull out the puppets. I'm going to tell the kids they are going to put on a puppet show. 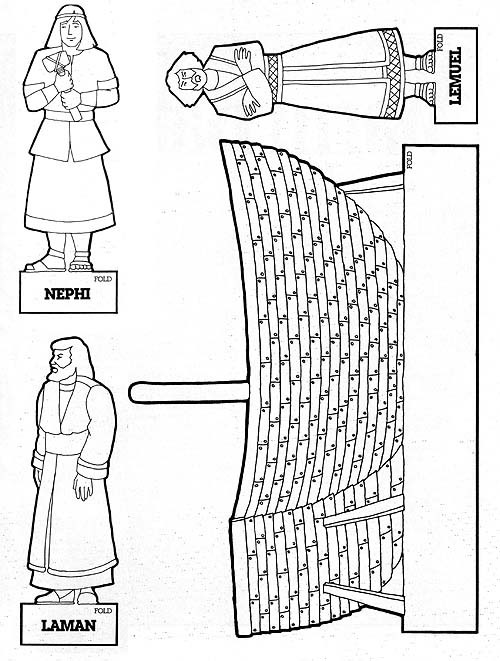 I'll have 4 kids come hold the figures for the first verse: Nephi, Lamen and Lemuel, Laban and the plates. Then I'll tell the Primary we are going to sing the story to the puppeteers as they act out what we are singing (posting words as necessary and having teachers help sing or playing the song on CD). I'll try to use half the Primary on the 1st verse taking turns with the puppets so we can sing it a few times. The puppeteers will also be in charge of leading the Primary in the chorus actions. Same thing for the second verse but we'll use Nephi, Laman and Lemuel and the boat. Find my lesson plan for teaching the 3rd verse HERE. *If you have a very large primary, I'd suggest printing several copies so each class will get a set of puppets. 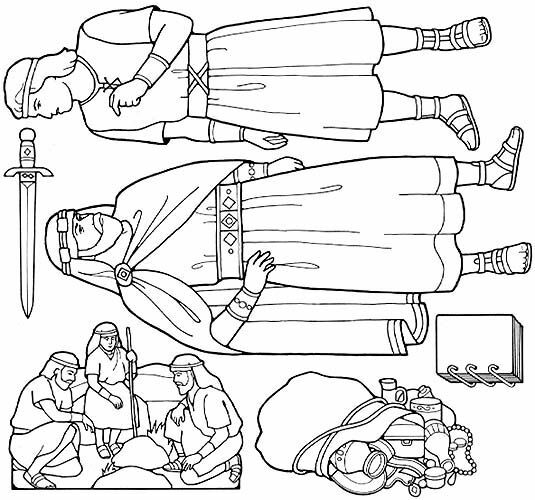 Teachers can choose children to work the puppets from their seats as indicated in the lesson plan above. Oops...thanks, I'll fix it ;). Thank you so much for sharing. This is a great combination of visuals and actions! Fantabulous...just what I needed for Sunday, easy and effective. Thanks for putting the visuals all in one spot. I'm doing this tomorrow but had a question, did you use some sort of backdrop for the puppeteering? Or just on a table or something? I a PC. Can you explain how to enlarge and isolate the images? Thank you! I used your ideas and the puppets and it worked wonderfully! The children loved the actions. Christine, I didn't do a backdrop. Thought about it but then decided it would be too much work so the kids just stood there. With the Jr. I put my hand on their head so they'd know when to raise up their puppets. Bonnie, I just copied and pasted the webpages onto Pages (similar to Microsoft Word but on Mac) and then kind of played with the sizes. I really didn't need to change much. Then I just printed ALL the pictures out and discarded the ones I didn't use which was a lot but whatever works, right? Everyone else, glad to help. For our Primary, it was a hit. The kids enjoyed the puppets and then being involved with the actions for the chorus. Still looking for help on this. It didnt go as smoothly as I'd hoped. How do you do the actual acting out part? Sorry about that...the kids just basically came up front and held the puppet. When we sang about that puppet, they just held it up. Some kids did a little more "acting" than others but for the most part it was simple. For Jr. primary I'd put my hand on their heads when their puppet should be held up. I did have some teachers come and do it and that was fun as they really hammed it up. I hope that helps. Good luck this week!! where can you find the figure for Laban? I have all the other puppet figures. I need to start to teach this next week so hurry hurry. Susan and I both overlooked that she's got no Laban. There is one if you are using the lds.org options. But I spoke with Susan and she will get Laban added this week (because she's the best!). Thanks for bringing this to our attention. Susan has updated her artwork to include Laban. I hope that helps you. If you purchased her artwork, you should have received an email from her with the artwork to download. I could not find the sing language for command on the link you sent. Is there something I'm missing. Thank you. Oh I found command sign language.